The Southwest Through Wide Brown Eyes: Along the Colorado River to La Sal Loop Road. Jumping back in time once again; and feeling very much like a companion of Doctor Who's. My first full day in Moab, Roy decided to introduce me to the Colorado River as it runs parallel to Route 128. This first trip along the route only took us as far as La Sal Loop Road, but if you go along you'll eventually see the ghost town of Cisco which was a main water stop for the steam locomotives of the Denver and Rio Grande Western Railroad. Route 128 continues on to Interstate 70, so you can take that West towards Moab again; stopping at Thompson Springs is a must if you're interested in ghost towns and petroglyphs, or head on East to Colorado. Now when you first turn onto Route 128, there is a small pull in area that has a little pipe sticking out of the wall and water runs from it. This is called "Matrimony Springs" and the legend is that if you drink the water from the spring, you'll come back to Moab, get married and live out your days there. Roy and I drank from the spring in October 2008, moved to the area in 2009, and were officially married in October 2010 in Moab and by the Mayor, David Sakrison. Coincidence? We don't believe in coincidence. All along the route you will be surrounded by immense sandstone walls, boulder areas and sand; the desire to park your vehicle, get out and begin to explore will be strong, very strong. The route is narrow and curvy, so park in the pull in, or parking areas along the roadway. You'll be driving parallel along the Colorado River for most of the drive along Route 128; some of the viewpoint areas offer spectacular photo opportunities. There are so many areas to pull over and have a picnic meal while watching the river flow with white tipped waves. While there are a few spots where you can actually go into the river for a dip, be careful as it runs fast and you don't want to be swept away. 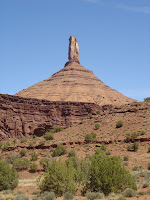 In Moab, there are many "adventure" businesses that offer rafting trips; Canyonlands at Night offers a dinner/boat trip along the river at night; cowboy style dinner and then a soothing ride along the river with music and history. We took the Canyonlands at Night trip on our 2006 visit, and I still get goosebumps remembering the experience; and they give you one heck of a dinner! 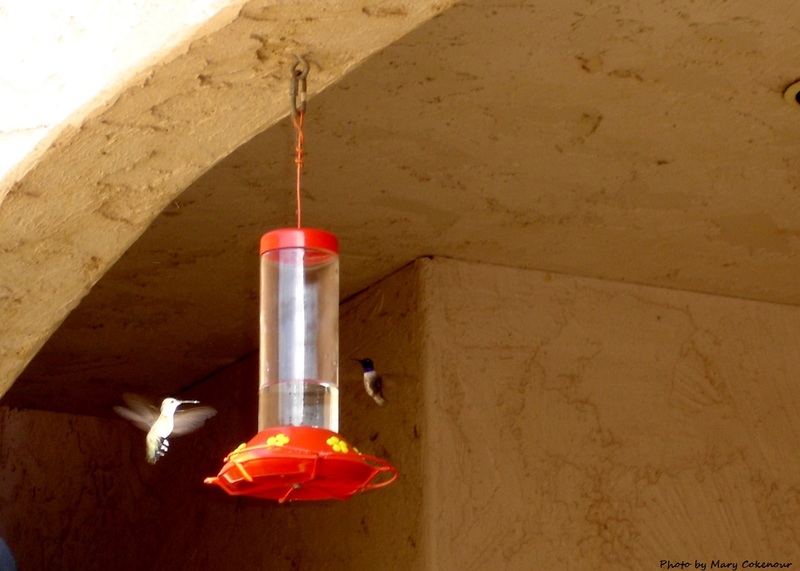 That was also my first experience seeing hummingbirds in flight; there were those red feeders that hold the honey water hanging around the outside dining area; the little birds zipped and zoomed around our heads and I laughed with childlike delight. Good experience, really good experience. The first real road you'll be able to turn onto is La Sal Loop Road which takes you up into the La Sal Mountains and through the Manti-La Sal National Forest; there is a 5 mile long side road which leads to Warner Lake and a campground. This road is two laned, curvy and narrow; we didn't make it very far up before finding a turn around spot and retracing our steps. Why? Well when you're on the passenger side, looking down 3,000 feet into a canyon, you do a lot of screaming as there is no shoulder. My mother-in-law tells me that no one has ever driven off the edge of the roadway into the canyon. However, Roy and I are known for doing a lot of things for the first time together, so we didn't want to be the first ones over the edge. We did try coming up the Loop Road from the Ken's Lake entrance, but same result...I screamed like there was no tomorrow. I have been getting better though as we try out new adventures, so I plan on trying again this year to do the entire Loop. No doubt I'll be writing about the experience. Before you reach that point of the road leading up into the mountains, you'll pass some interesting formations. Actually, the first ones you'll notice immediately as you make the turn onto the road from Route 128. There is a pickup truck pulling a boat; not the actual vehicles, but sandstone formations that highly resemble them. 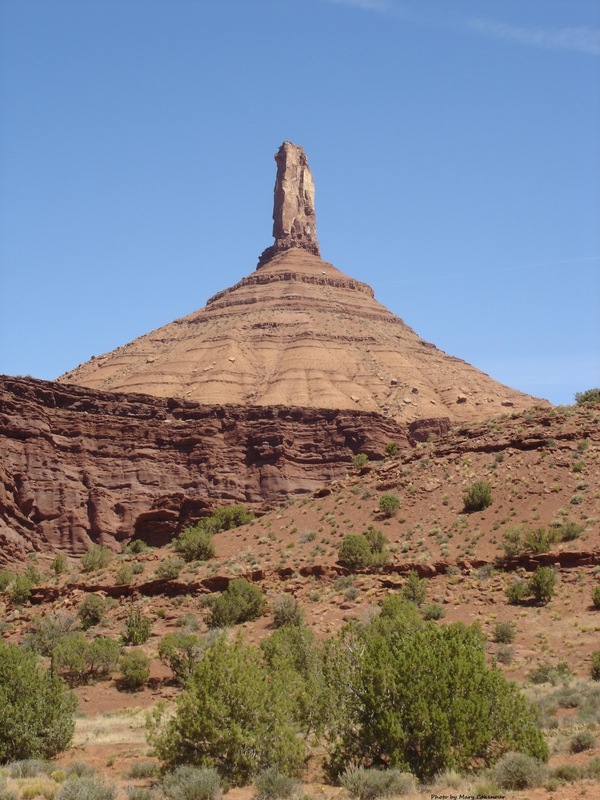 ﻿﻿Castleton Tower, a desert tower, has been used in many television commercials. Remember the one where the man leaves a house, parachutes down a sandstone tower and walks to his SUV? Right next to it is The Rectory, also known as The Priest and Nuns. Before I forget, along Route 128 there is a giant Desert Rose that you can park near to explore further. Naturally formed out of sandstone by the wind and rain, this Rose is about 5 feet high and six to seven feet wide. I've only seen the smaller version in museums, but I keep looking anyway for one to add to my collection. There's a little taste of Route 128, starting in Moab and heading towards Cisco. I'm exhausted just remembering it; time for a coffee break.